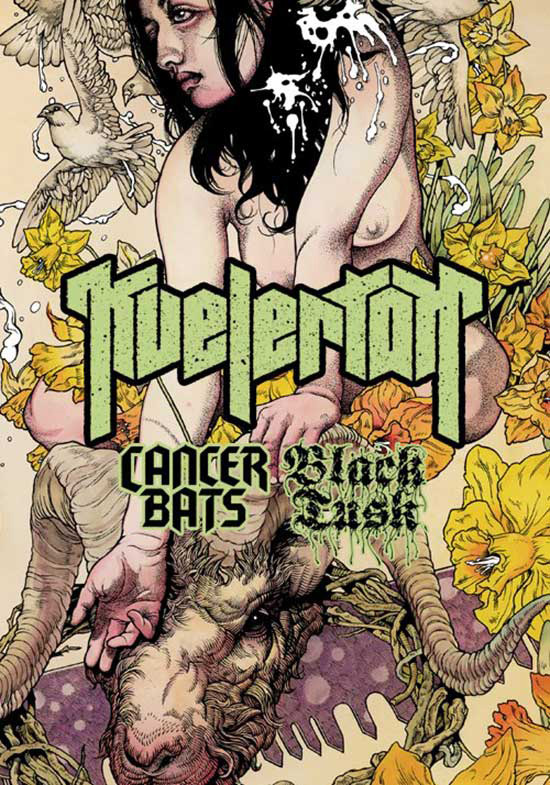 CANCER BATS will be returning to the US in April and May with Kvelertak and Black Tusk. The combination of these high energy live acts makes this tour one not to be missed. The shows begin April 21 in Chicago, IL and wrap up on May 20 in Allston, MA. CANCER BATS recently released a new EP: Bat Sabbath – Bastards of Reality. The EP consists of five Black Sabbath covers and was inspired by the overwhelmingly positive response the band received for their “Bat Sabbath” Canadian tour in 2011, as well as the Sonisphere 2011 after party. Bootleg videos from the Sonisphere set can be seen now on metalblade.com/cancerbats. Bat Sabbath – Bastards of Reality is available now on iTunes for $4.95. Tour dates are listed on the TOUR DATES page (see tab above). Critics and fans across the globe have heaped praise upon Dead Set On Living. Fans can purchase Dead Set On Living directly from metalblade.com, as well as iTunes, Amazon, and local record stores. This entry was posted in METAL and tagged Allston, Black Sabbath, Black Tusk, Cancer Bats, Celebrities, Chicago, Entertainment, Extended play, gaming, iTunes, KVELERTAK, metal radio, metal radio shows, Metal Radio Supremacy, Music, Philadelphia media, Philadelphia Metal Radio Shows, Philly internet metal radio, Philly metal radio, ramming speed, Rik Johnson, rockdefradio, speed signs, The Welding Room metal radio program, The Welding Room radio program, WRDR-DB. Bookmark the permalink.